At the appointed time, the adventurers arrive at the place outside the gates as they were told. The crude arena comes into view and Deves is waiting in front of a set of heavy wooden double doors built into a sturdy wooden wall about 10 feet high. One this side of the wall you can see a ledge for people to stand and look over to the other side. The walls curve around from the door and apparently make an oval shaped arena. Deves says, "When you are assembled into your marching order, go ahead and open the door. There will be another door open on the other side and your opponents will be entering at the same time. Don't ask what they be, it will be a surprise." The dwarf chuckles and makes his way towards a ladder to climb up to the ledge to watch. There are about 10-15 people here to observe and Raddick is one of them. He gives you a cheerful wave and yells down, "Go get 'em guys! We got money riding on this." Blick arrives early and wonders what beasts the team will face on this glorious day. Kneeling, he draws his sharp sword and vows once more to Bahamut that he will vanquish the enemies that are placed before him. His whole life, of nine years, Blick has known that he is being tested by the Divine One and that he has lessons that need to be learned. It is almost as if he had failed his God in some way that he cannot recall. Grimacing, the paladin stands and raises his sword to the sky and a look of relentless endeavor transforms his visage. Blick sheathes his sword and makes sure the two belt pouches are easy to access during the battle. He checks the spikes on his shield to make sure they are sharpened and ready. Then he waits for his comrades, looking up to the sky now and then. Surveying the sky for cloud cover and presence of bright sunlight in the arena, if it is open to the sky. This will pertain to his light sensitivity. OOC: Weather is within seasonal norms, partly cloudy and warm. The arena is in the woods so even if the sun is out in full, there is some shade from the trees and such. I will be nice and Blick can be okay. 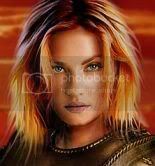 Sefrenia finishes her morning devotions and then collects her gear and weapons, Heironeous guide my sword this day. Evil should be vanquished. With a satisfactory nod of her head, she heads towards the location of the contest. Upon arrival she sees that the kobold is already there and greets him, "Blick, good day to you. Fine day for combating evil is it not?" OOC: According to our battle plan, I am towards the front. I do have a reach weapon so I can fight from behind the two little folk if needed. Ashleigh made her way to the arena, but not before placing her last 20 gold on the event - to win. In it to win it Asheligh. Despite your stomach flip flopping and a firm desire to run the other direction... You. Will. Do. This. She arrived soon after Blick and Sefrenia and inserted herself in the proper order behind them. After she heard Deves speach, she drew her dagger and clasped it as if it were a relic that would somehow magically ward her from harm, before she lowered her weapon to a more natural position. Oooh Kaaay. Here goes nothing. Well... Actually, everything really. She addressed the party, and perhaps herself, in a voice that broke a bit before stablizing, "I... I am ready." -- If violence isn't solving your problems, you are probably not using enough of it. OOC: Actually I assumed and I think I posted that Raddick took everyone's spare cash, except Brunhilde's, and placed the bet. Seeing that the red-head is looking a little nervous, Raddick calls down to Ashleigh, "Hey cutey, buck up! Me and the gang here are watching and pulling for you!" Brunhilde appeared at the appointed place the following morning, and found most of the others already there. She adjusted her armour, tested the weight of her shield (for the 5th time) and made sure all her weapons came free from their bindings easily and without snagging on her clothing. Gripping one of her two hand axes in her right hand, she grinned at the others, then called to Blick "ready!" and took her place at the front of the line as they waited for the doors to open. Arthos wakes up in one of the spare rooms, wondering exactly how he got in there. After checking that all his stuff was in the room (and it was), he got dressed and looks over his book of spells. Alright, which spells to prepare for this event. Not knowing who the group will face, I should prepare one spell to affect one and one spell that affect a group. With the spells prepared and memorized, he grabs his walking stick and equipment and makes his way to the arena. OOC: Sorry for the long time, but I am having issues with my cable and internet. The cable company says they got someone working on it, but it has been 10 hrs since then. I'm at the neighbor's house now. Just letting you know in case it is starting to become a big problem. Blick grins as the rest of the team arrives and move into position. Looking from one to the other, he considers tactics. He looks at Sefrenia and the halfling and motions for the cleric to step back one pace so that the team is now in an X formation. This will enable the cleric to strike foes engaged with the front fighters if needed and to be able to cast spells to aid the party if required. Blick looks at Arton and smiles. Blick kneels and draws a rough outline of the formation and points to the spot where he will be. Looking at the others, he draws some more figures across the 'arena' from them to indicate foes and draws a fast connecting line between Blick's position and the foes. He looks at Arton and points at the foes that Blick was now grouped with and waves his fingers and cups his hands against his face as if he is sleeping. Raising an eyeridge, he waits for the wizard to indicate he understand the possible scenario. Arthos just watches intently as Blick draws up a plan in the ground. It seems that Blick wants to draw the enemy to himself, and let me cast my sleeping spell. Can he resist the spell? I know that the religious zealot cast a form of sleep during the little brawl, but only the dwarf was affected so her verison of it could be weak. As Blick wait for confirmation, Arthos looks at him and nods in understanding. OOC: I havent been playing the DnD for long (well long compared to other DnD players, 8 years is quite a while), but this is the first time that we are taking the lead from a kobold. And one who can only say one word. I think that is a nice little development to say the least. Catching the meaning of the little paladin's meaning, Sefrenia says, "Very well, little warrior. Sound advice. Open the door and we can enter." She looses her shield and has a sling bullet ready to fire. Blick grins as the others catch his meaning. The door opens to reveal the oval shaped interior. There are a few barrels standing on end that can provide cover. The opposite doors open as well and three smaller creatures step through, followed by a large one the seems to fill the doorway. The three small humanoids have yellowish orange skin, flat faces, broad noses, pointed ears, and wide mouths with small sharp fangs. They walk upright about 3 feet tall, but their arms hang down, almost to their knees. They are wearing leather armor and armed with light wooden shields, javelins and shortswords. The bigger humanoid is muscular and savage looking, standing over 7 feet tall with darker orange to almost brown skin. Course hair covers most of its body, its mouth is full of long sharp fangs and its nose is much like that of a bear. It is also wearing leather armor and carrying a light wooden shield, javelins, and a morningstar. Both sides are aware and can see each other. The monsters and players start flat-footed until they have acted in their first turn. Terrain Notes: The barrels will provide +4AC cover. Treat as a 5x5foot wall section to determine if it applies. If the barrel completely blocks all Line of Sight to a square containing a small creature adjacent to the barrel, the target can have Total Cover. Asheigh stood frozen for an instant as they strange humanoids moved into the ring. Ashleigh waited for them to make a move. And, as soon as they did she hesitatingly raised her arm and pointed a finger at one of the ugly humanoids. Only a moment later a burst of energy sprung forth from her finger and nicked the creature in the process as it advanced on them. Get a grip. Pull it together. Those things were not even human... So, you better be ready to do that again. .
Last edited by Fenris on Tue Aug 17, 2010 7:45 pm, edited 2 times in total.